Kevin Smith's brace had put East Fife two goals up. At 2-0 up and with a couple of minutes to go before half-time, East Fife had one hand on all three points. It hadn't been a vintage first half performance, but a Kevin Smith double had given the Fifers a comfortable cushion to start with in the second 45. Sadly for the Methil men, a Sean Crighton effort on the very stroke of half-time completely turned the game on its head and the hosts managed to net another three times after the interval. Had East Fife been able to stand firm for those closing moments then there's every chance they would have run out comfortable winners. The game got off to a decent enough start, Darryl Duffy and Jonny Court both having half chances for either side. It had been a bit of a grind for East Fife, but there was a real touch of class and quality about the opening goal. From nowhere Aaron Dunsmore broke into the Airdrie half. 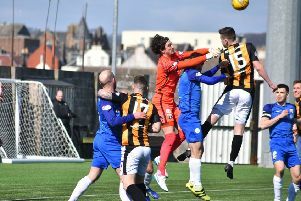 Centre half Ross Dunlop had raced up to support his forwards and raised his hand for the pass as he made his way into the box. His job was done, he was in the area, but Dunsmore still had to do his. The ex-Hibs defender slid a brilliant pass through the heart of the Airdrie defence to his team mate who in turn then fed Kevin Smith on the edge of the six yard box. Smith ensure a quality move had a quality finish by blasting his strike in off the underside of the bar. It was a goal out of the blue but things were to get even better for the Fifers. A corner in front of the main stand couldn't be cleared by the Diamonds defence and Court sent a looping cross to the back post. There waiting was Kevin Smith who nodded home from a couple of yards out. It was so far so good, and the Methil men had a spring in their step. But as the clock was ticking down towards the interval, Grant Gallagher's corner was finished off by Crighton, completely changing Ian Murray's half-time team talk. And whatever he said at the break had an effect with Airdrie going on to seal the win in the second 45. The equaliser came when former Fifer Kyle Wilkie was brought down inside the box by Craig Watson. Darryl Duffy slammed home the spot kick. There was an air of controversy about number three, with Leighton McIntosh appearing to handle the ball as he broke inside the Fife half. He played the ball to Wilkie who made no mistake. The Fifers were scunnered, and Airdrie wrapped up the win with another McIntosh effort this time finished off by Duffy. Airdrieonians - Hutton, O’Neill, MacDonald, Crighton, Page, Gallagher, Victoria (Conroy 82), Millar, Duffy, Wilkie (Stewart 80), Carrick (McIntosh 67). Subs - Robertson, Cairns, McKenzie, Russell. East Fife - McDowall, Watson (Watt 77), Dunlop, Meggatt, Docherty, Dunsmore, Davidson, Agnew, Smith (Currie 77), Court, Dowds (Slattery 62). Subs - Kane, Linton, McBride, Bell.